Aircraft Communications FAQ - SCI Technology, Inc.
What is SCI’s experience level with aircraft intercommunications? 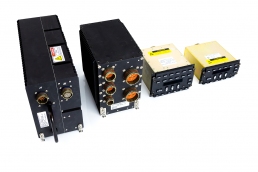 We’ve been in the aircraft intercommunications business since the late 1970s, delivering products for the F-15, AV-8B, F-16, F/A-18, V-22, C-130 and C-27 aircraft. We developed the first digital intercom for the AH-64D Apache, as well as the first-generation FireComm® for the AH-64E. Our current system, the second-generation FireComm, offers instant and clear communications between all connected users aboard an aircraft platform. Do SCI’s aircraft products require forced-air cooling? No, none of our products currently require forced-air cooling. This allows us to offer our customers a clear SWaP-C advantage. Does SCI have the capability to perform full qualification testing? Yes. We routinely perform full qualification testing to meet customer requirements. Please refer further inquiries to das@sci.com.